Transitioning from one of late night’s most iconic shows to an entertainment career outside the hallowed halls of 30 Rockefeller Plaza can be a bumpy one. For longtime Saturday Night Live cast member Andy Samberg, he decided to take a look at the successful career blueprints from other famous SNL alumni. He decided to take a page from Parks and Recreation star Amy Poehler‘s playbook because she smoothly moved from late night to primetime. Even with that map, the 35-year-old comedian wasn’t exactly sure what he was going to do next. However, Samberg made a wise decision not to jump at the first project that comes his way. 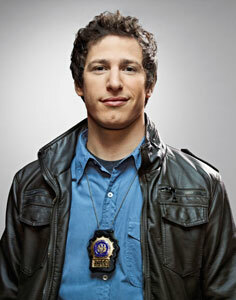 When Samberg was approached by Arrested Development‘s Terry Crews for Brooklyn Nine-Nine, he came aboard once he saw a rough draft of the concept. The comedy will feature the actor as a detective surrounded by a squad of misfit cops whose precinct is shaken up with the arrival of a new captain played by Andre Braugher. Not only did Samberg sign on to star, he is also a producer. He felt like he could juggle both roles. Even with his new creative venture, Samberg still looks back wistfully at the show he left in May 2012. With Brooklyn Nine-Nine set to premiere on Sept. 17, it’s pretty sweet for the former NBC star to work on the same set where he was a production assistant for Spin City years ago. The difference is pretty dramatic.